Supervisor is a person who is in charge of, and coordinates the activities of a group of employees engaged in related activities within a unit of an organization. He is a front line manager and is responsible for getting the non-executive employees to carry out the plans and policies set by the management. A supervisor is also sometimes being called as a front line supervisor since he is the first link between the management and the non-executive employees. A supervisor plan, direct, motivate, and monitor the work of non-executive employees at the operational level of the organization. Supervisors are the first-level executives, since they have only non-executive employees reporting to them. Supervisors can also be second-level supervisors when they supervise a combination of other supervisors and non- executive employees. 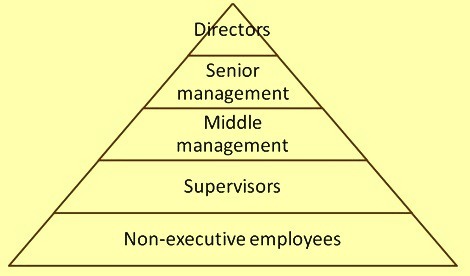 Place of supervisors in the organizational structure is given in Fig 1. The main job of a supervisor is supervision which is defined as instructing, guiding, monitoring and observing the employees while they are performing their duties in the organisation. The word supervision is the combination of two words, i.e., supervision where super means over and above and vision means seeing. So, supervision means seeing the activities of employees from over and above. Supervisors are member of management and hence they also carry out in the front line the so called four functions of the management namely planning, organizing, directing and controlling. Supervisors are leaders for their team. They play very important role in the organizational functioning. Their thinking and actions are to be professional and disciplined. They are to have positive approach to work environment. They are to think in a systematic way. They need to approach the work positively, rather than passively. They are required to accept the responsibility of making things happen for the better of the organization. Non-executive employees moving to supervisor positions are to shift their roles from those that entail just following orders, to those that require making task assignments, helping others solve problems, and making decisions. They are to become increasingly aware of their involvement in a complex system of organizational activities, and they are to act accordingly. Supervisors need to acquire a sense of the many factors at play in their spheres of influence, and from this sensitivity, they are to develop an invaluable flexibility. This enables them to do the right things at the right times for each situation they face. Supervisors occupy an important position in the structure of an organization since they perform a pivotal role. They connect the employees to the management and vice versa and hence become the primary conduit for the flow of information within an organization. Top down, management imparts its goals and values through the supervisors who can best explain to the employees what these mean and how they may affect employees. Bottom up, the front line supervisors ensure that employees’ voices are heard, listened to their concerns and responds to them, and passes that feedback to the management. Supervisors being in a direct contact with the employees have got multifarious functions to perform. The objective behind performance of these functions is to bring stability and soundness to the organization which is necessary for the productive and the efficient performance of the organization. Various functions of the supervisors are enumerated below. Supervisors are required to get the decisions which are taken at the management level implemented by the employees working under them. They are to make sure that all the instructions are communicated to each and every employee. Supervisors for carrying out this function efficiently are to be aware of the reasons behind those decisions and are to be convinced that the implementation of the decisions are going to benefit the organization. In turn, supervisors are to convince the employees working under them so that the decisions get implemented in a disciplined manner in the organization. Supervisors facilitate control. Control means matching of actual output with the planned output. Whenever the employees are under constant supervision or monitoring of the supervisors then close check can be kept on the performance at each step of the work. In case of deviations from the plan, supervisors are able to take corrective measures by immediately issuing revised instructions. Thus the supervision function of the supervisors ensures continuous monitoring of the job which in turn is helpful in strict control over the activities of subordinates. Supervisors by constant supervision ensure optimum utilization of resources. When the work of the employees is constantly monitored or observed then they follow the proper procedures of the work which in turn ensures optimum use of the resources. This leads to minimum wastage. Proper supervision and guidance of supervisors encourages disciplined working of the employees. Disciplined working improves the efficiencies of the employees as well as the processes which in turn improves the productivity. Disciplined working also results into systematic working, lower waste generation and lower product rejection rate. It also helps in employees fulfilling the plans and meeting of the targets. Since the supervisors carry out the supervision from the front line and they directly deal with the employees, they are the best people who understand the pulse of the organization and in the case of disturbed environment they are in a better position to know what is brewing amongst the employees. Hence there feedback is very important and is to be taken very seriously by the organizational management. Further they are the best persons to give feedbacks of subordinates. Their feedbacks report regarding the working of employees working under them usually becomes the basis for the performance appraisal of the employees. Their report is also helpful in resolving complaints, grievances and problems of the employees which in turn creates a peaceful working atmosphere at the work place. Supervisors are to be very good in communication since they play the role of the linking pin or mediator between the employees and the management. Supervisors with their communication abilities try to remove the communication gap between the management and the employees as they pass on the management decisions to the employees and employees’ grievances, complaints and problems to the management. Since supervisors issue instructions and orders to the employees they are to make sure that these instructions and orders are clear to all the employees and carries the meaning what is intended. In this way supervisors improve communication in the organization. It is better for the organizational management to provide training to the supervisors in the techniques of effective communication. Supervisors play an important role in the improvement of the employees’ motivation. The relationship with the supervisor is a very good incentive to improve the motivation level of the employees. While guiding the employees, the supervisors encourage employees to perform to their best capacity. Supervisors play a key role in maintaining group unity among employees working under them. This maintains harmony among the employees since their grievances are removed and their differences are solved with satisfaction. This helps in teamwork and in the creation of a peaceful environment of work. Supervisors to succeed in their job are to have (i) the complete knowledge and skills in the technology employed, (ii) skills in the interpersonal relationship, (iii) management skills, and (iv) administrative skills. Career related skills required in supervisors include (i) problem solving, (ii) communication, (iii) leadership, (iv) learning, (v) knowledge sharing, (vi) ability to adapt to change, (vii) capacity to build a cohesive team, (viii) ability to get along with people, and (ix) capacity to present oneself professionally in public. The personal characteristics required from a supervisor are (i) integrity and credibility, (ii) tenacity, dedication, and perseverance, (iii) flexibility, (iv) risk-taking propensity, (v) willingness to take initiative, (vi) tolerance for stress, (vii) positive attitude, (viii) dependability and reliability, (ix) creativity, and (x) energy and good health. The supervisors’ job has three orientations. These are (i) employee centred, (ii) tasks centred, and (3) administrative work. Employee’s centered supervision is a method of supervision which places an emphasis on a genuine concern and respect for employees, and on the maintenance of effective relationships within a work group. Tasks centered supervision is a method of supervision which places an emphasis on the job or task that employees are expected to perform to produce results. Supervisors have to carefully balance these types of tasks. They are to pay as much attention to interpersonal factors as to technical and administrative matters combined. Supervisors are to spend as much time maintaining individual satisfaction, group cohesiveness, direction, and morale as they do pushing for productivity or task accomplishment. However, it is not necessary that being nice is the answer to the employee’s productivity. It is not. Supervisors who focus on job demands to the exclusion of their interest in the welfare and the development of their people do not get the long term results they are looking for. Conversely, supervisors who bend over backward to make work easy for their employees do not get good results either. It takes a balance between the two approaches which is needed. Effective supervisors balance the application of their skills between the work to be done and a concern for the employees who perform the work. 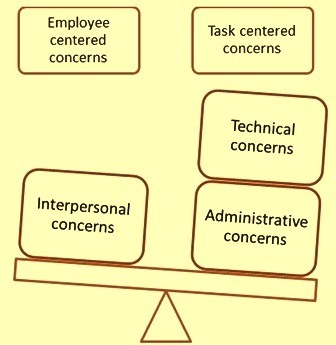 The balancing of supervisor’s job is shown in Fig 2. Supervisors are also required to have good knowledge in the management principles. Practical knowledge of these principles helps in their daily work. These management principles are described below. Work is required to be divided so that each employee performs a specialized portion. This division of work provides clarity in job assignments and helps employees increase their skill levels. Supervisors not only have the right (authority) to give orders and instructions, but they also are to accept responsibility for whether the work is done correctly. Supervisors are not only responsible for exacting discipline and building morale among members of their team of employees, but they are also to reciprocate by offering something of value to them. Said another way, if supervisors want loyalty and cooperation from employees, they are also to be loyal and cooperative in return. The unity of command requires an employee to report only to one superior. If an employee reports to more than one superior, confusion and conflict are likely to result. The unity of direction requires that the organization need to have only one master plan and one set of overriding goals. Such unity of direction is lost if for example the purchase department slows down the production department’s output by buying materials from a less costly but undependable supplier when there is an commitment of the organization to dispatch the materials on time. Besides the principle of unity of direction, it is also necessary that all individuals, especially managers and supervisors, place their personal interests second to those of the organization. Pay and rewards (remuneration) are to reflect employee’s efforts and, more important, employee’s contribution to the organization’s goal. Employees are to be paid according to their worth rather than at the whim of a supervisor/manager who might be inclined to play favorites. Orders and instructions are to flow down the chain of command from the higher manager to the supervisor. Formal communications and complaints are to move upward in the same channel. In practice, however, it has proved to be a good idea to permit and encourage the exchange of work information sideways between departments as well. The real trouble seems to occur when a manager bypasses a supervisor with instructions to an employee or when an employee goes over a supervisor’s head to register a complaint. This is known as blindsiding. Employees are to be treated equally and fairly. Lack of this equity on the part of a supervisor invites dissatisfaction and conflict among employees. As an example, lack of equity takes place when a supervisor gives one employee a break while sticking to the rules for another. Supervisors are to encourage initiative among employees. Other things being equal, a supervisor who allows some flexibility on the part of employees under him is infinitely superior to one who does not do it. Supervisors are key figures in the organization structure. They have to play very crucial role in the effective functioning of the organization. They connect management with the employees. Hence they have to bear pressure coming to them from the either side. The pressures felt can be handled best when they (i) admit the need for help, and seeks it from peers, superiors, and employees, (ii) provide a strong role model for employees by demonstrating good work habits, (iii) anticipates both changes and crises, and prepares for them, (iv) listen a lot and minimize arguments with other, and (v) learns to handle the inevitable stress from the job.